Finally a recipe that doesn’t revolve around carbs! I’ve been getting a lot of collard greens in my CSA box lately which usually means a big pot of Caldo Gallego soup. After scouring the fridge and freezer for a smoked ham hock (I usually have a couple in my freezer for emergencies like this) and coming up short, I decided that Caldo Gallego wasn’t an option and came up with something new to do with my greens. 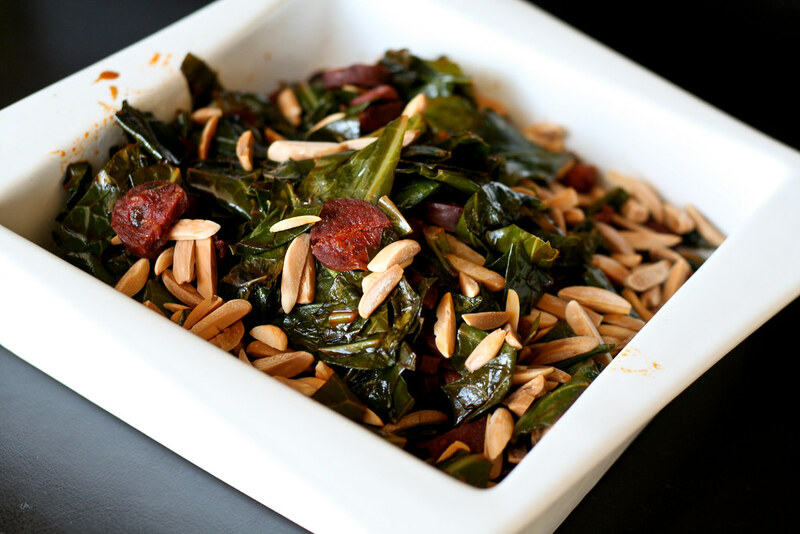 This is a simple side of collards is flavored with what you all might recognize as my favorite ingredient – chorizo. I think it might be my most-recurring ingredient after olive oil or salt. What can I say? I’m a sucker for spicy cured pork products. I also love how the rendered fat – bright orange and flavored with pimenton – coats everything with a luscious meaty flavor. And it takes these collard greens to a whole new level. Chorizo makes them spicy and smoky, sherry lends them a nice bite, honey balances the bitterness in the greens and toasted almonds add the perfect amount of crunch. I actually ate this as a main dish with some brown rice and it was one of my favorite things I’ve made all year. Definitely a keeper! Preheat the oven to 350° and toast the almonds for 10 – 15 minutes, or until the begin to brown. Remove and set aside. While the almonds are toasting, make your collards. Set a large skillet over medium heat. Saute the chorizo for 5 – 7 minutes or until the fat is mostly rendered. Add the collard greens, sherry, water, honey and salt. Give everything a big stir, cover and let simmer for 10 – 15 minutes or until your collards are wilted and tender. Toss with the toasted almonds and serve. Makes 4 side servings or 2 main servings (if served with rice, bread or pasta). Any thoughts about how this might work with other greens (aside from cooking times)? We don’t get collard greens where I live, but the recipe looks very nice. I love chorizo! Heron – This should work with any greens. Like you said – cooking times will vary (spinach very little time, kale a little more time). Enjoy! Bless you! I have seen fantastic looking collard greens in my store week after week and never bought them because I didn’t know what to do with them (i.e. I had never found a recipe that looked good enough to try). Well I saw this recipe, and I kid you not, set out the very next day to try it. I used chicken and turkey andouille sausage instead of chorizo because I wanted to make it a little healthier, but otherwise I followed the recipe to a T. And it was amazing! The greens are hearty without being bitter, and the sauce really enhances their flavor, rather than masking it. And the toasted almonds and sausage give it a nice smokey and wonderful flavor. Bravo! I will definitely be making this again and again! This looks fantastic! I have a dish made with chorizo whenever I go to the Portuguese restaurant, but I’ve never bought the sausage itself. Do you always remove the casing? Is this necessary, or do you just prefer to do so? I will buy a loop of it the next time I am at the Portuguese grocery, just so I can try this recipe. You describe its effect so well! quinn – Thanks! I usually remove the casing if I’m cooking with it since it tends to shrivel and sometimes turn white. If I’m just slicing some to eat with cheese and crackers, I’ll leave the casing on. Thanks so much for the additional info! This looks delicious. Have long been looking for a nice chorizo recipe to use up the one that has been living in my fridge for a few weeks now. Your recipe will be the one tonight. Will try it with pasta for dinner. Thanks for sharing. This dish looks really appetizing. The chorizos are surely delicious. I really like your recipe and I hope you continue to do more.